The Ngorongoro crater and conservation area ranks right up there among Africa’s most popular wildlife destinations. Almost everyone wants to come here and see this amazing natural phenomenon on their trip to Tanzania - and rightly so. There is a wide choice of accommodation in and around the conservation area and we can offer you a range of hotels and lodges if you are planning an Ngorongoro safari independently. Just get in touch with us before you plan to go and we will be able to advise you with regard to transfers, lodges and tour packages. 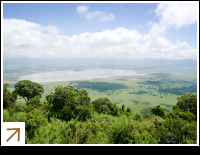 Below are a selection of our tours that visit Ngorongoro as part of the itinerary. An amazing chance to see the best that Tanzania has to offer on this great safari. All the favorites are covered and fingers crossed for the adventure of a lifetime. Get your boots on because it’s time to get up close with the African bush. On this tour, you will experience the original and best way to go on safari – on foot. This is the dream African adventure! Tour Tanzania takes you from the foothills of Kilimanjaro across to the baobab-studded landscape of Tarangire National Park and the Ngorongoro Crater. Don't miss out on this amazing and luxurious flying safari, offering you less time on the road between the parks and more time spent watching the wildlife, and then on to Zanzibar! A unique opportunity to explore two different parks all while based in one place.